Over 20yrs of using and reading everything related to supplements and nutrition so I am not a newb or a bro or biased in any manner either. Nutrabio has done a tremendous job proving them to be a brand I can trust in an often sketchy industry. The amount of transparency and quality throughout their manufacturing and end product is unmatched. For a customer that is not to be taken lightly. I want to support that effort and venture. Everyone should! 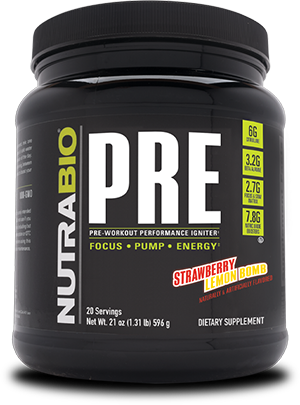 With regards to Pre it is probably my favorite Nutrabio formula and product. Amazing!! I love my pre workouts and this one stands out for me. It's consistently my go-to these days. Heavy stim pre's come and go but this one consistently works provides a ton of benefits without side effects/crashes. The new formula is excellent. Great, clean energy with no crash. Keep up the great work NB!!! As a "stim-junkie," I do not seem to get much energy from this product. I am going to try 1.5 scoops today. Pump is good, Tropical Fruit Punch tastes horrible to me. It tastes like there is coconut in it. I think Ill go back to using Green Apple Pre-Extreme. My issue with Nutabio Pre is the l-theanine content. I actually like l-theanine and I take it every night before bed because it relaxes me. The last time I took Nutrabio's pre-workout I felt sedated. I felt a pump from the citrulline and a slight energy increase at first. The energy increase felt like it would be gradual and increase over time but it didn't. It just stopped and then I felt extremely peaceful. I felt really calm and I felt like my blood pressure as well as my heart rate were low. I felt like I could take a nap. That's not how I want to feel before I work out. It's a shame because I like Nutrabio and everything they stand for but the pre workout is just not for me. Also, I can not take the extreme version because yohimbine would cause a straight up panic attack for me. I received sample packs from this company last week....If your sensitive to caffeine use only half a scoop. One great benefit about this product is that it has 6g of citrulline which gave me a crazy pump before i headed out to the gym. This product i would definitely buy. Just one thing is the flavor was to sweet but would try another flavor... Thank you NutraBio for these sample packs. Ochiai, M., Hayashi, T., Morita, M., Ina, K., Maeda, M., Watanabe, F., & Morishita, K. (2012). Short-term effects of L-citrulline supplementation on arterial stiffness in middle-aged men. International journal of cardiology, 155(2), 257-261. Stout, J. R., Cramer, J. T., Zoeller, R. F., Torok, D., Costa, P., Hoffman, J. R., ... & O’kroy, J. (2007). Effects of ß-alanine supplementation on the onset of neuromuscular fatigue and ventilatory threshold in women. Amino acids,32(3), 381-386. Smith, A. E., Walter, A. A., Graef, J. L., Kendall, K. L., Moon, J. R., Lockwood, C. M., ... & Stout, J. R. (2009). Effects of ß-alanine supplementation and high-intensity interval training on endurance performance and body composition in men; a double-blind trial. Journal of the International Society of Sports Nutrition, 6(1), 1-9. Warskulat, U., Brookmann, S., Felsner, I., Brenden, H., Grether-Beck, S., & Häussinger, D. (2008). Ultraviolet A induces transport of compatible organic osmolytes in human dermal fibroblasts. Experimental dermatology, 17(12), 1031-1036.